I wanted to use up some of our tomatoes in a more creative way. I told Hubby I was trying a new recipe for lunch on Sunday. He’s pretty used to that happening these days, but he said this is not at all what he was expecting. I think he was expecting something sweet. 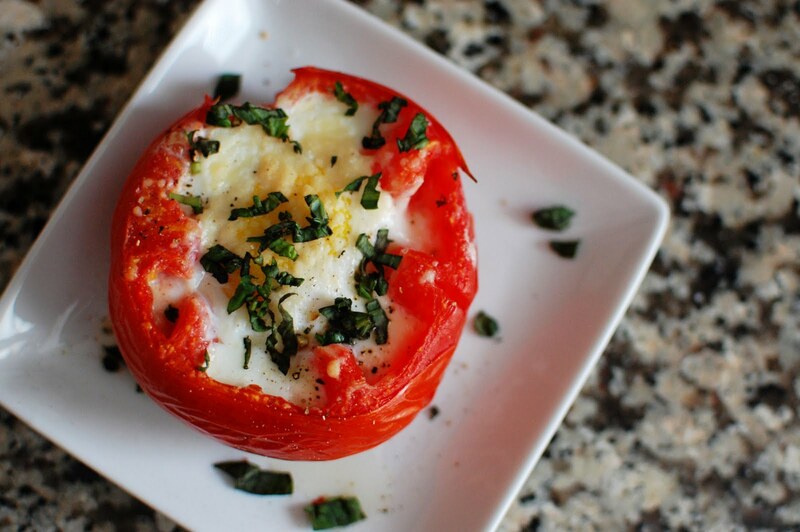 The baked egg in a tomato came out really good. The yolks were just slightly runny which is exactly how I like it. The combination of a fresh tomato, some cheese, and a baked egg made for a perfect weekend lunch. Slice off the tops of each tomato. Using a sharp paring knife and a spoon, gently cut around the inside perimeter of the tomato and scoop out the seeds. Place tomatoes upside down on a tea towel or paper towel for a few minutes to let some more of the water drain out of the tomatoes. If you skip this step, the tomatoes may come out a little watery after baking them. Place the tomatoes in an oven proof baking dish. Depending on the size of your tomatoes, place 1-2 Tablespoons of the shredded Mozzarella in the bottom of each, making a little well with your fingers so the eggs will lay flat. Break the egg into a small bowl. Carefully pour the egg into a tomato being careful to keep all the whites inside the tomato. Repeat with other egg and tomato. Bake the eggs for 10 minutes. They will just begin to set by this time. After 10 minutes, sprinkle the tops of the eggs with Parmesan cheese. Bake for another 7-13 minutes, until the eggs are set to your desired consistency. Remove the eggs from the oven and let sit for 2 minutes. Sprinkle with salt and pepper, and garnish with fresh basil.